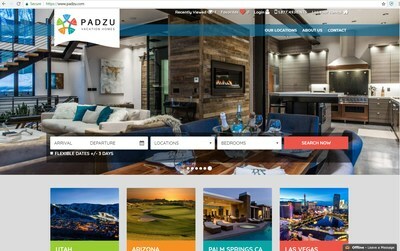 SCOTTSDALE, Ariz., June 28, 2018 /PRNewswire/ — A new vacation home management brand is finally bringing together four currently independently ran vacation rental management companies under one umbrella: PADZU Vacation Homes. The new PADZU Vacation Homes manages every aspect of owning a second home, from maintenance and housekeeping to guest check-in and rental collection and more. PADZU pulls together vacation service brands that its founders have owned for years from four states: Arizona, California, Nevada, and Utah. The company started in Scottsdale, Arizona in 2008 with their initial venture, Top Scottsdale Vacation Rentals. In 2014, the company acquired the Palm Springs, California vacation-rental company Golf & Tennis Realty. One year later, the company opened Luxury Vegas Suites. In 2016, they opened Ovation Vacation Rentals in Park City and Salt Lake City, Utah. The group also has new office is coming to St. George, Utah this fall. The company has been working for over a year to pull the four existing entities under one overarching and concise brand: PADZU Vacation Homes. Founder Ryan Dame says that doing this allows them to bring together their best-in-class local market brands and grow into a singular national brand. “PADZU will allow us to leverage technology solutions and marketing budgets, to tighten operational procedures and centralize core functions like accounting and reservations,” Dame explained. “This will allow us to offer the best homes in our local markets to guests from around the world at the lowest possible price,” Dame added. Under the PADZU brand, the company is devoted to consistently exceeding guest expectations and helping each guest create a memorable experience. Under that value promise, PADZU plans to expand into multiple markets across the United States and Mexico. They are currently looking to add select rental homes to the existing inventory. Vacation home owners who are interested in finding someone to manage that second home for them are encouraged to contact PADZU to start the conversation. Interested parties can connect with PADZU by visiting the website at padzu.com or by emailing info@padzu.com. PADZU vacation rentals offers private residences for vacations, events, getaways, or corporate housing needs. The company provides spectacular homes, condos, and resorts coupled with five-star hotel quality service in Arizona, California, Las Vegas, and Utah. For more information about PADZU, visit padzu.com.